The major salivary glands, three pairs in total, are found in and around your mouth and throat. 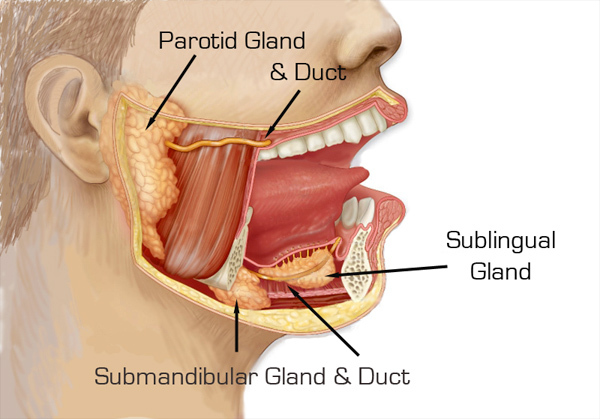 The major salivary glands are the parotid, submandibular, and sublingual glands. The parotid glands are located in front and beneath the ear. A duct, called Stensen’s duct, drains saliva from the parotid gland into the mouth, at the area of the upper cheeks. The submandibular glands are found on both sides, just under and deep to the jaw, towards the back of the mouth. This gland produces roughly 70% of the saliva in our mouth. The submandibular duct, called Warhtin’s duct, enter the floor of the mouth under the the front of the tongue. Sublingual glands, meanwhile, reside beneath the tongue, and supply saliva to the floor of the mouth as well. There are many (between 600 to 1,000) tiny glands called minor salivary glands. These glands are 1-2 mm in diameter and coat all the mucousal surfaces or lining of our mouth and throat. Together, the salivary glands produce saliva, which help moisten our mouth, soften the food we chew, initiate digestion, protect the teeth from decay, and help keep the mouth clean by washing away germs. The flow of saliva is stimulated by the presence of food in the mouth, or even the sight and smell of food. The parotid glands produce a type of saliva that is “serous” which means it’s more watery and thin. It is has the protein Amylase that helps begin the process of starch digestion. While we are not eating, the parotid glands each contribute to 10% of saliva in the mouth, but when stimulated by eating the saliva each parotid gland produces accounts for 25% of the saliva in the mouth. 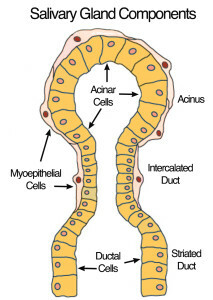 There are many different types of cells that make up the small little parts of the gland that produce saliva and secrete it (you can see these different cell types on the diagram). Because of the variety of cell types, there are many different types of tumors and cancers that can develop in the parotid gland. Additionally, because there are several lymph nodes inside the parotid gland, at times skin cancers over the temple, scalp and cheek areas can spread to this area; additionally, lymphomas can occur in these lymph nodes. The salivary glands are constantly working, and can be affected by many medical conditions, medications, and even not drinking enough water. Infections and inflammation of the gland can cause it to swell up and become painful. Obstruction of the ducts, which can happen because of salivary stones or narrowing of the duct from infection, can cause the saliva to back up into the gland and lead to it to swelling up as well. If you would like to know more about the salivary glands, schedule a consultation with parotid surgeon Dr. Larian today by calling (888) 687-6118. Next, learn about parotid & facial nerve anatomy. At the Center for Advanced Parotid Surgery, our team of medical professionals specializes in performing minimally invasive parotidectomy with a focus on facial nerve preservation and facial reconstruction. Here we’ve put together the most common questions we get from patients. Ensure all your questions are answered. Write them down when you think of them. You should have a clear idea of exactly what surgery is planned, what will be done, the risks, all your options and what the expected benefits are. You should also have a clear expectation of results that is in alignment with the doctor’s expectations as well. You should tell your surgeon what medications and supplements (including herbal and OTC medications like ibuprofen) you are currently taking. Ensure that you have stopped taking any medication or supplement that our surgeon asks within the proper timeframe. If you are not already leading a healthy life, it is best to start doing so several weeks before the surgery, not just before. Be active, eat healthy and quit smoking (if you smoke). It really depends upon exactly what was done during the surgery. In most cases, a brief hospital stay of four days or less may be required. Can a Facelift Be Performed at the Same Time as a Parotid? In many cases, yes. In fact, it is often safer to do the surgeries concurrently because the parotid surgical procedure carefully traces the facial nerve and positions it safely. Doing a facelift at the same time lowers the chance of accidentally damaging this nerve at a later time because of its shifted position. Depending on the size of the tumor removed, there may be excess skin on one side of the face that will need to be tightened. To maintain facial symmetry, the other side of the face may also need tightening. So a facelift at this time may be an ideal choice. Dr. Larian and his team will advice you if a facelift is an option for you. How long does Parotid surgery take? Most parotidectomies take between 3 and 4 hours. Do Benign Parotid Tumors Need to Be Removed? The most common approach to dealing with parotid tumors, even benign ones, is to surgically remove them. These tumors can grow to abnormal sizes that can disfigure the face. More importantly, even a benign parotid tumor can become cancerous if left alone to grow. Do salivary gland stones go away on their own? There are a number of non-surgical procedures that often help the stones go away without surgery. If that doesn’t work and the salivary gland is completely blocked and swelling, surgery is the next best step. How long does it take for a Parotidectomy to heal? You can plan on one to two weeks for initial incision healing and about six weeks for complete incision healing. Scar creams are advised for use to hasten healing and should be used for the first six weeks. Incisions may continue to change in form for up to two years after surgery, but most scars are hidden behind the jawline and ear and not readily noticeable.